Ancient volcanic plains in the northern high latitudes of Mercury revealed by instruments onboard the MESSENGER spacecraft. Mercury is the solar system's Greenland. We know it's there, we've heard some interesting stuff about it, but we just don't give it a whole lot of thought  and that has long included NASA. Nobody's slouch at sending unmanned spacecraft all over the cosmic neighborhood, NASA had launched just a single mission to Mercury in 30 years  the Mariner 10 probe, which made three flybys of the planet in the 1970s. In 2004, that changed, as NASA launched the far nimbler, far more sophisticated Messenger spacecraft, which arrived in orbit around Mercury a year ago and has been surveying the planet with laser altimeters, gravitational instruments, cameras and more ever since. Now, a pair of papers appearing in the online edition of Science make it clear that the long overdue return was amply worth the effort. Mercury, it turns out, is a far more dynamic  and far less predictable  place than we once believed. One of the things that always kept Mercury missions near the bottom of NASA's to-do list is its proximity to the sun. The solar blowtorch long ago blasted off whatever tenuous atmosphere or water the planet may have had. Temperatures on the sunward side of Mercury reach a blazing 840 F (450 C), while on the shadowed side they plunge to -346 F (-210 C). Not likely to find any life on a hellscape  or icescape  like that. Even the planet's geology had little to offer. Its small size, just 3,032 mi. (4,880 km) across, means that its interior would have cooled off long ago, ruling out such subsurface activity as volcanism. And its gravitational field suggests a dense iron core accounting for fully 50% of its diameter (compared to 9.5% for Earth). Mercury may have simply formed out of a particularly iron-rich portion of the primordial cloud, or its lighter, shallower materials may also have been blasted away by the sun. Either way, the planet would be a decidedly static place. The pair of papers released this week give the lie to that idea in two different ways. In one, investigators used more-detailed gravitational sensing to make better estimates of the size of Mercury's core and came to the conclusion that even a whopping slug of iron representing half of the planet was probably too small. Instead, the core must be a full 85% of the total diameter. And on top of that, there is a thinner layer of iron sulfide. "Overall, there must be 200 km (125 mi.) of iron sulfide, meaning that that, plus the core, makes up 90% of the planet," says MIT geophysicist Maria Zuber, who was one of the authors of both papers. That, in turn, means a mantle and crust that are a maximum of just 185 mi. (300 km) deep  little more than a rocky rind over a metal sphere. "Mercury," says Zuber, "has an interior structure unlike any other terrestrial planet." A denser planet ought to be deader planet, geologically speaking, but that proved untrue as well. In its earlier days, the solar system was a free fire zone, with swarms of meteors and asteroids flying around in all directions, and moons or planets without a protective blanket of gas regularly getting clobbered. Volcanoes and other subsurface process could erase a lot of the craters, but when the lava stopped flowing and the plates stopped moving, the world would be stuck with the craters it had. But Mercury, which ought to be fairly covered with impact scars, has some anomalously clean patches, particularly a 930 mi. (1,500 km) diameter crater with a relatively clean basin  meaning that after the big rock that created the big crater hit, few smaller ones followed. What's more, the crater has been heaved up, so that what should be the deepest portion of its basin actually rises higher than its rim. 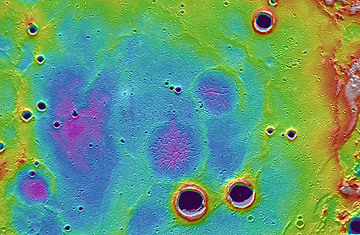 Taken together, those two features mean surface lava-flows and subsurface shifting long after Mercury should have gone still and cold inside. "There's a lot more evidence for volcanism than we've seen before," Zuber says. "We find some evidence of this dynamism in many places on the surface." Making things even more difficult is that the standard geological models don't explain how this can be. Surface turbulence and volcanic flows are often caused by what are known as convection cells  recurrent swirls of molten material that bubble up in the mantle, cool and then descend again. When the material rises high enough that it breaches the surface, lave streams out in all directions. But for complex thermal and mechanical reasons, the diameter of the surface area that's smoothed by the lava bleed shouldn't exceed the depth of the convection cell. A 100-mi. deep cell, in other words, can't produce a 200-mi. wide plain. Since Mercury's entire crust and mantle are only 185 mi. deep, there's no way a convection cell within them ought to have produce a 930-mi. prairie. "The model is being violated in some way," Zuber says. "You'd have to have a convection cell that reaches down into the core and that isn't known to happen." OK, so Mercury's uplifted craters and surprising convection cells will never quite match Saturn's rings or Jupiter's watery moons or the not-crazy possibility of microbial life on Mars. But there's something wonderfully plucky about a little world that just refuses to die  that even after 4 billion years in one of the most punishing spots in the solar system still has a few lively surprises left to reveal.